Loni's allergy free – Every recipe is free from wheat, gluten, corn, yeast, dairy, egg, peanuts, tree nuts, sesame seeds, tomato and seafood, tastes great and is easy to prepare. Every recipe is free from wheat, gluten, corn, yeast, dairy, egg, peanuts, tree nuts, sesame seeds, tomato and seafood, tastes great and is easy to prepare. Are you frustrated trying to find everyday recipes free from multiple allergens to cook for your family? Sick of deciphering codes to see if the recipe is free of your allergen list? Welcome to the Loni’s Allergy Free Hub. I am Loni and I am here to help you navigate the tricky world of cooking and living with multiple food allergies and intolerances. I will equip you with the knowledge, resources and recipes to enable you to be confident in cooking delicious, easy-to-prepare meals for you family and friends that happen to be free of 11 key allergens. Yes, you heard right, every single recipe I develop is free from 11 allergens and still tastes amazing – empty plates are my speciality! Every single recipe I develop is free from wheat, gluten, corn, yeast, dairy, egg, peanuts, tree nuts, sesame seeds, tomato and seafood and I have carefully developed them using readily available non-allergen alternatives and of course the taste great too! Through my cookbooks, e-books, posts and blogs, I will provide you with recipes, helpful facts, allergy-friendly product and company reviews, funny stories and experiences from my journey, stories from other sufferers about their experiences, as well as handy tips on cleaning out and restocking you pantry full of allergy-friendly product and checklists for starting school. Whilst a diagnosis of multiple allergies/intolerances is daunting and scary, once you look beyond what you can’t eat and begin to appreciate anti-inflammatory drugs and work with what you can eat, there is no looking back and there are plenty of possibilities. Delicious meals that everyone can enjoy are a reality. As a food scientist with lots of experience in product development, I can help you with the science stuff – one of the most overwhelming parts! I will break the information down so it is easier for you to understand and navigate. I will help you understand what allergies and intolerances are, how to read labels, what alternative ingredients are out there, where to get them and most importantly how to cook with them. As an intolerance sufferer myself, with the rest of my household having no allergies or intolerances, I understand that meals need to be quick and easy-to-prepare and need to suit the dietary needs and tastes of the whole family. 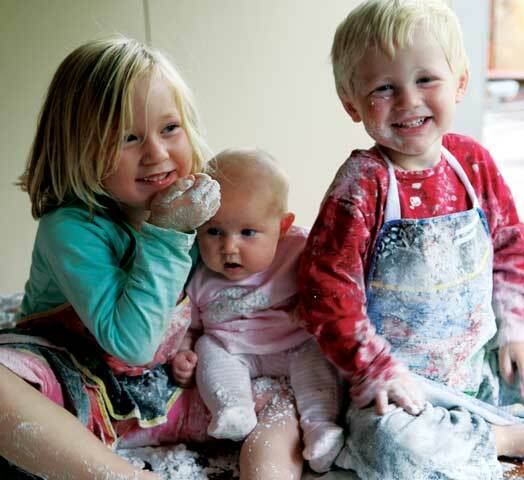 I love to cook, especially with my children, so many recipes are perfectly suited to cooking with little helpers. Family meals and gatherings are an important aspect of my life. They are an opportunity to share stories of the day’s activities and an opportunity to catch up on the lives of my extended family. With several members of my extended family having anaphylactic allergies, it is a must for me that everything I cook and serve at family gatherings is allergy-free and enjoyed by everyone. No separate dishes – just one meal for everybody. When I develop new recipes, or discover some new allergy-friendly ingredient or a great product or café, my newsletter subscribers get the inside scoop. You can also sign-up to receive my blogs via email, so make sure you’re a newsletter and blog subscriber – it’s absolutely FREE. I have developed every recipe to be free from 11 key allergens, delicious and easy to prepare. Each recipe has been cooked in my home kitchen, and is accompanied by a colour photograph, taken by me, to show you that you can easily recreate this dish in your home to look just like the photograph. A child with allergies/ intolerances is coming to my house to play…..